Since my iPhone has email and a bunch of other sensitive information on it, I’ve always set a passcode. But I’ve always been a bit dubious about the security of a 4-digit code. In fact, one of my coworkers once saw what I entered as we were walking down the street. While I’m not really worried about coworkers, and 10000 possibilities might be enough given there’s an Erase Data option, I still wanted more security — especially once I get an iPad and may have more data on it. 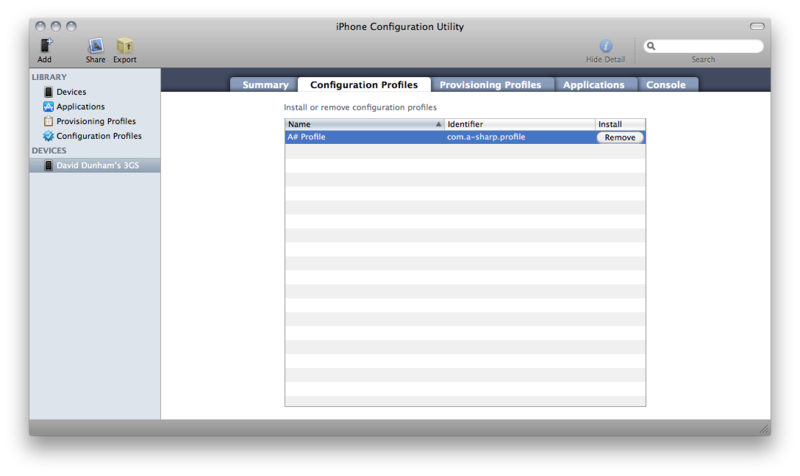 Enter iPhone Configuration Utility. While this has a wide variety of enterprise options, it’s actually easy to make a simple profile. Then attach your iPhone via USB. Click it in the left pane. Click the “Configuration Profile” tab, then click the “Install” button for your new profile. You’ll confirm this on the device. 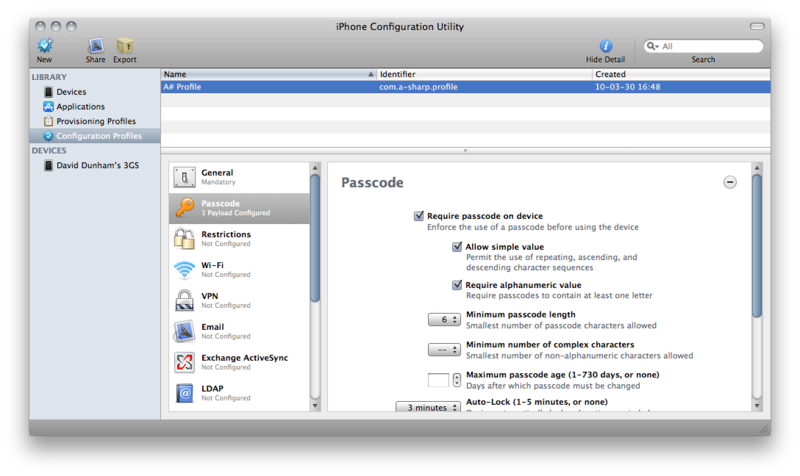 Now you can set up a passcode as usual, in Settings > General > Passcode Lock. Now when you unlock the screen, you’ll get a full keyboard instead of a 10-digit pad. Note that you’ll still be able to make emergency calls (911) without unlocking. My computer game King of Dragon Pass won the award for Best Visual Arts at the second annual Independent Games Festival. I was really proud of this — we consciously went against the grain by creating quality watercolor art, and scanning it. The artists did a great job. I’ve put a selection of the original watercolor & ink art for sale at daviddunham.etsy.com. I'll be adding more artwork (the game had over 400 illustrations), so if you don’t see something right away, subscribe to the shop RSS feed. How much data is enough for your iPad? Wondering about the 3G plans that AT&T will be offering for the Apple iPad? Is 250 MB spread over a month enough? If you already have an iPhone, you can find out. 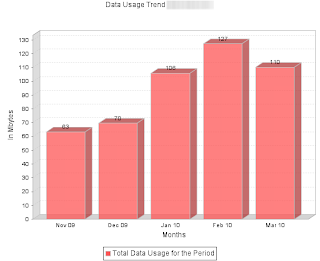 I just noticed that AT&T has added a “View Past Data Usage” button to their web site. For me, the cheapest data plan would be fine — I must do enough of my networking while connected to a WiFi network.